There are several kinds and if I'm not mistaken, they are called maezashi. The most distinctive one is the jade tsunagi-dango (linked dumples) worn only by Gion Kobu maiko under 20.
ewoodham, - Oh my how on earth did you get that lovely kanzashi? I adore all of these! I loved the red goldfish one so much that I tried making one - it turned out so cute! Thanks everyone for posting these great unique ones, they are so inspiring! moonblossom If I had hair, I would be lusting over this one. A bat! http://www.japanese-antiques.jp/eBayitem/Y/Y810.JPG I'm not sure, but this looks like a compass? ## image needed ## Has anyone ever seen a lobster kanzashi? ## image needed ## I would love to see a lobster made with tsumami. And I love this sakura on Mameharu, very cute with the full blossoms among the shidare. I really LIKE this... now if only I could figure out how to make one. ewoodham This thread cannot die, it's too fabulous! star & crescent? Anyone else think of sailor moon? :lovelove I am also obsessed with the shamisen head! What a great little detail! Since it's May, in honor of this, may I please request pictures of fuji kanzashi? Every single one is stunning imo! This topic is great ! I was wondering will Kotoha wear such rare kanzashi like she did as a maiko? 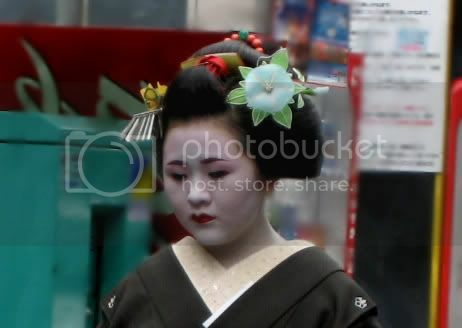 I mean it is hard to wear something diffrent when you become a geiko ..
hibana wrote: Is this thread meant to be maiko-only? I've got lots of pictures of really unusual kanzashi, but none of them are maiko-specific as far as I can tell. Is this thread meant to be maiko-only? I've got lots of pictures of really unusual kanzashi, but none of them are maiko-specific as far as I can tell. Thanks Tahanala-san! 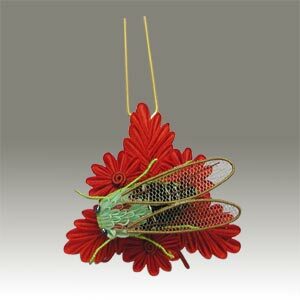 Now, I know I have much to learn about this whole kanzashi thing. I almost mistook those ume blooms as sakura! ewoodham I also noticed that she is wearing the same collar as that of Mamehana in the topmost picture of this thread. Are both of them from... er... Ninben? (Yeah, I'm not sure if it's Ninben or some such thing...) They are from the same okiya. It's call the Ninben, and spelled like this: イ just イ. It is a bundle of freshly-opened ume blossoms. Cute! Oh! 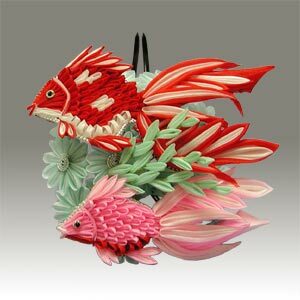 I found some awesome non-traditional kanzashi on YJA some time ago- will post pics when I can dig them out. I am so in love with all these kanzashi! 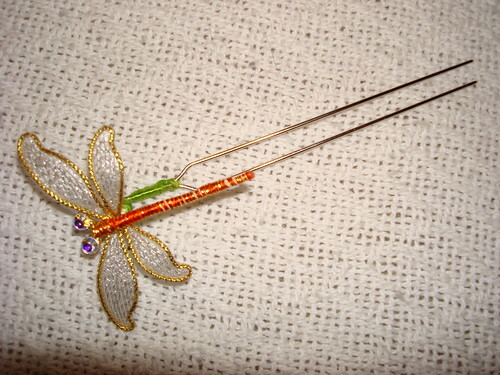 I'm partial to my dragonfly kanzashi I bought at Ikuokaya in Gion. 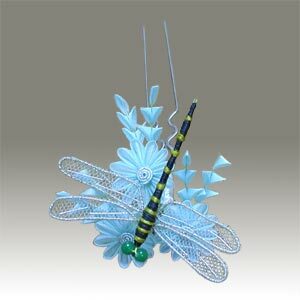 Funny thing was, when Andrew and I were walking there - I even said, if there is a dragonfly kanzashi, I'm buying it. A brand new one... Koai! 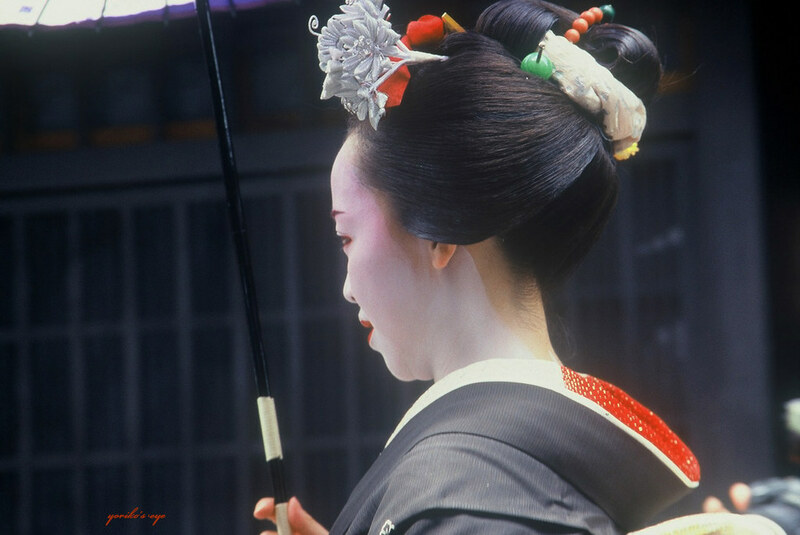 Several of the unusual summer ones are Gion Matsuri kanzashi. Actually, Fujika-san's geimei was Kocho. This one stumps me. I'm pretty certain it is a sakko one, but I cannot figure out what it represents! But anyway, these are all so beautiful kanzashi! Thanks for posting them!! Daffodils are spring kanzashi, so you wouldn't see them by ro-season. I have posted another picture of tsumami narcissus right above. 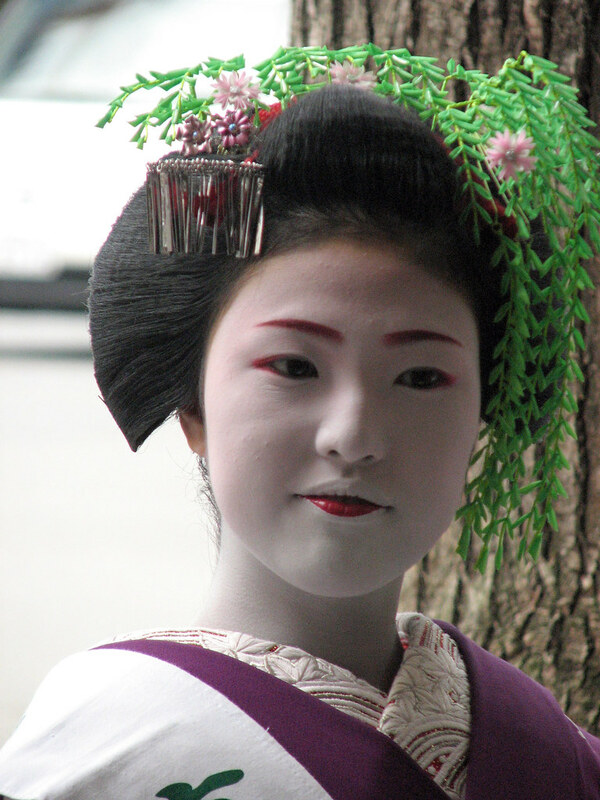 I had never seen this one on another Maiko. I am late to the game on this one, but Hobby Lobby does sell pins similar to the ones Zipangu sold. You can find them in the jewelry making department. Yes! Ookini! Now I can get to making my June Maiko set! :kawaii: It is really, really helpful! Ooh, that tutorial is REALLY useful! Thank you so much Wisteria_Gardens ...now I can make some traditional style kanzashi!! I promised a help-out tutorial on this one. I know the effect may look horrible, but... It works for me! Wisteria_Gardens That would be wonderful if you could do that! Thank you! Sarcasm-hime those are the hairpins I mean! Thank you for the advice. You mean the long two-prong metal hairpins? Zipangu Treasures used to sell them but they've disappeared. I just make my own now out of heavy-gauge wire. I'm interested in this too. I've looked in craft and hair and beauty stores but can't find them. Or what to call them to look them up online? I'm interested about how/where people find the hairpins to which attach the kanzashi? Is it a normal hairpin you get from a store or do you make one yourself somehow...? Topic: Kanzashi for mature persons??? Re: Kanzashi for mature persons??? rubyminky I have a purple pair of tiny kanzashi that live on my dresser along with a huge 10cm dark red one made from some scarf material which I normally wear on the top of my top of my plait. I would wear that in a heartbeat, SuzumeOdori! I suppose it depends on what you are confident in wearing. I'm 30 and for everyday wear, I tend to stick to smaller and/or subdue coloured tsumami kanzashi. However for special occasion I will wear kanzashi with short falls and I generally match them to my outfit. Most make here kanzashi that suit better to younger persons. 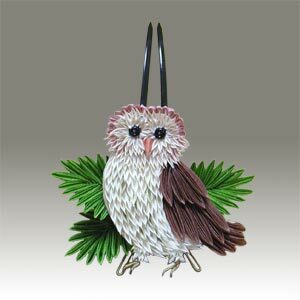 What kind of kanzashi could be done for more mature women? Topic: Need some advice about glue. Re: Need some advice about glue. Thanks! This is a really helpful advice - about the model. I have to think of something, since I don't have a model, who would help me out, or a wig - so very helpful. I strongly suggest that you figure it out, I prefer you alive !!!! Oh yes, I tried a grey mum on a kusudama-ball, and it looks like something wilting, oh dear !